It is time to get out on the water and spend the night fishing under a submersible light. The weather has been extremely nice and comfortable. The water temperature has been reaching 70-degrees throughout the day, which is fairly warm. Many fish will hunker down during the heat of the day and come out to feed in the evening and throughout the night. The night is a great time for predators to hunt because the low light conditions give them an advantage over their prey. Navigating the waters in the dark can be a bit tricky so it is a good idea to find an area and tie up or anchor for the night. Once you have chosen an area, the best way to draw fish to you, is by dropping a submersible light. The glow of the light will attract tiny aquatic insects (the same way a moth is drawn to a light bulb). The smaller baitfish will come to feed on the aquatic insects, and the larger predator fish will come to feed on the baitfish. Now that you have created a food chain below the boat you can drop a few lines and start catching some fish. 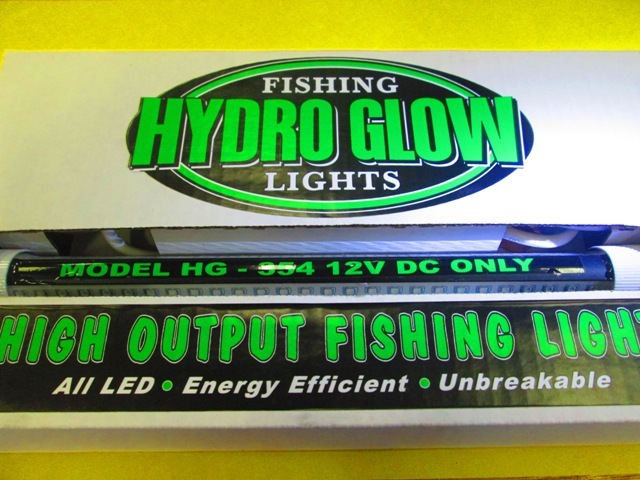 Hydro Glow Lights are L.E.D. submersible lights. They make a 12″, 24″, and a 48″ light. Submersible lights come in many sizes, but a good rule of thumb is more light equals more fish. The larger lights draw fish from a much greater distance than the smaller lights do. Most lights come with a 20′ cord. Some nights fishing close to the surface works well and other nights dropping the light down to 20′ works best. Smaller less expensive lights will work but, the fluorescent bulbs are not as bright as the L.E.D. lights and the L.E.D. lights are much more durable and come with a warranty. One of the best baits to use would be live minnows. Try using a slip-float to adjust your bait to the desired depth. Other popular bait to use, are nightcrawlers, mini jigs, and Power Bait depending on what species you are targeting. 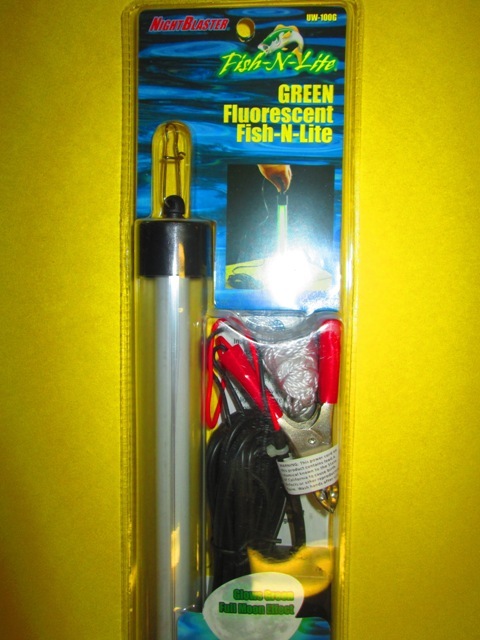 The light will attract many different species including trout, bass, crappie and catfish. A great way to spend a warm summer night is under the stars and fishing. Try your luck at night fishing under a submersible light.